Born near Brantford, Ontario on 6 November 1863, he moved West to Winnipeg in 1882 and spent those early years working for the Canadian Pacific Railway. He married Mary Olivine [Olive] Rollard (1865-1943) at Winnipeg on 18 February 1885 and had two daughters; Delia Ruth Vanderlip (1885-?, wife of William Henry Irwin), and Bella Lucia "Belle" Vanderlip (1890-?, wife of David Charles Manuel Hayes, later re-married to Frank Pratt). The family maintained their residence at 350 Ross Avenue, and he locally founded the Ward Two Electors’ Association. 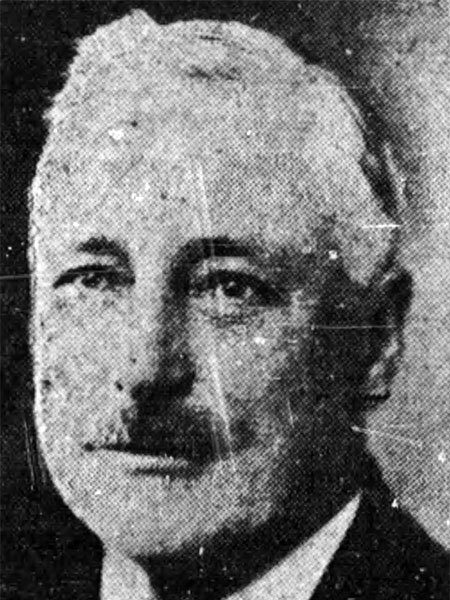 He stood as an Alderman candidate on several municipal elections during the 1920s and 1930s, though never successfully. Early indication to his later showman traits were reported as early as April 1890, when he reportedly caught a large reptile and placed it on public exhibition. In the years following the turn of the century, he was a parlor proprietor and managed locations along Portage Avenue and Main Street. In 1912, he managed the newly-opened Victoria Theatre, and in 1915, he brought forth to City Council plans for a grand public exhibition, on which he publicly wagered $5,000 of his own funds that he could complete the event without incurring a net loss of public funds. Though Council declined the idea, it paved the way for future endeavours. In February, 1919, he established the Winnipeg Exhibition Association Limited (WEAL) with Charles Herbert Weagant, Walter Hamilton Fogg, Gordon Thompson Howden, and Earl Everton Van Alstyne and worked as the head manager. Under the same WEAL name, he filed for incorporation under the Companies Act via Letters Patent. Assent was received in June 1927, with Vanderlip and Weagant then joined by Clarence Kelly Rosborough, Wilford Stewart Boyd, and Betty Bessie Blancke. He served as President of the entity, and during which time was the head organizer for the Winnipeg summer fairs in 1925, 1926, & 1927 held at the old Winnipeg Exhibition Grounds. Following that, he leased River Park from 1928 to 1932 and continued operating the large amusement complex. He also maintained side-ventures in coffee as well as peanut-roasting. He was a member of the Showmen's League, as well as a life member IOOF and AF & AM (St. John's Lodge). At some point after the First World War, he crafted two brass light standards out of spent shell casings and donated the ornamental pieces to City Council. These gifts were accepted and arranged prominently in the council room, flanking both sides of the Mayor’s chair. On 2 May 1934, he returned home with pain from a lodge meeting and made his way to the Winnipeg General Hospital. He lapsed consciousness overnight, and died in the early hours of 3 May. Burial followed at the Brookside Cemetery. In commemoration of his community contributions, City Council dimmed both his gifted light standards during the 8 May council sitting. “The reportorial round [Mr. M. C. Vanderlip],” Winnipeg Daily Tribune, 29 April 1890, page 4. “Sultana parlors,” Winnipeg Tribune, 25 November 1904, page 5. “Manhattan billiard parlors,” Winnipeg Tribune, 11 November 1905, page 16. “Hayes - Vanderlip,” Winnipeg Tribune, 7 September 1911, page 8. “Bets $5,000 he can make exhibit pay,” Winnipeg Tribune, 2 February 1915, page 1. “1915 Exhibition plan killed,” Winnipeg Tribune, 10 February 1915, page 1. “City may hold fair in 1920,” Winnipeg Tribune, 26 February 1919, page 5. “Exhibition Association gets letters patent,” Winnipeg Tribune, 14 May 1919, page 1. “The Winnipeg Exhibition,” Winnipeg Tribune, 30 June 1919, page 5. “Made-in-Canada show approved by City Council,” Winnipeg Evening Tribune, 21 April 1921, page 3. “Seeks Aldermanic honors in Ward 2,” Winnipeg Evening Tribune, 3 November 1921, page 6. “Claims election of Flye is void,” Winnipeg Evening Tribune, 9 December 1921, page 1. “A vote for C. Vanderlip,” Winnipeg Evening Tribune, 23 November 1922, page 2. “Mayor drives inaugural nail for summer show,” Winnipeg Evening Tribune, 12 May 1925, page 1. “Alderman want permanent fair,” Winnipeg Evening Tribune, 23 July 1925, page 5. “Summer fair in 1926 is plan of Chas. Vanderlip,” Winnipeg Evening Tribune, 7 August 1925, page 1. “Summer Fair big success says manager,” Winnipeg Evening Tribune, 12 August 1926, page 7. “Big revue for summer fair,” Winnipeg Evening Tribune, 26 July 1928, page 7. “Vanderlip may seek seat on Council from Ward 2,” Winnipeg Evening Tribune, 22 October 1930, page 18. “Outdoor swimming baths at River Park proposed,” Winnipeg Evening Tribune, 23 July 1931, page 2. “Charles A. Vanderlip will run in Ward Two,” Winnipeg Evening Tribune, 1 October 1931, page 3. “C. A. Vanderlip dies suddenly in hospital,” Winnipeg Tribune, 3 May 1934, page 3. Death notice, Winnipeg Free Press, 4 May 1934, page 20. “Kenora asks Ash Rapids be made deeper,” Winnipeg Evening Tribune, 9 may 1934, page 9. Companies Office corporation documents (CCA 0059), 581W - Winnipeg Exhibition Association Limited, Archives of Manitoba. Companies Office corporation documents (CCA 0059), 791W - Winnipeg Exhibition Association Limited, Archives of Manitoba.